Wrap the copper wire around the nail and touch the ends of the wire to the battery. Be careful to always wrap the wire in the same direction. Wrap it as tightly as you can. Try to pick up the paper clips. Does it work? Be careful, the battery may get hot! Try the experiment again with more wire wrapped around the nail. Can you pick up more paper clips? What happens if you use a bigger nail? A nail made of a different material? 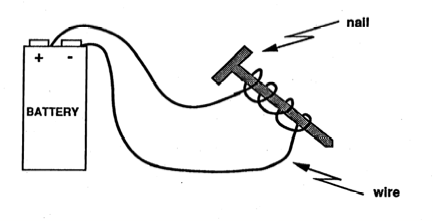 An electromagnet is a magnet that can be turned on and off. In this experiment, the battery is a source of electrons. When you connect the wire to the battery, the electrons flow through the wire. If there is not a complete circuit, the electrons will not flow. Electrons behave like little magnets and when they flow through a wire, they create a magnetic field, which turns the nail into a magnet that can pick up paper clips and staples!